Three a cappella groups, one powerful night of song. Join us on Saturday, March 9th at 8pm as we bring together some of the best vocal music in the region. Free on-site parking. Tickets available now in advance for $16. This event is sure to sell out, so order your tickets now! The entrance to the parking garage (3845 Wisconsin Avenue NW) is located at the corner of Wisconsin Avenue and Rodman Street NW. Follow signs to the Arts building and RLS Meeting Room. Venus d Minor has been selected to perform at the National Christmas Tree on Wednesday, December 19th from 6-6:30PM. Our set will include some holiday classics, as well as some classically Venus tunes with our signature funny lyrics. Where do you find this Christmas Tree location, you say? Well, on the National Parks website, you can get the exact latitude and longitude of our location…wow! We say, just look for the REALLY BIG TREE next to the curved street on the back side of the White House, called the Ellipse. We’ll see you soon! Catch Venus d Minor at SING OUT FOR SHELTER concert at 8 PM Saturday, March 10, 2018 in Washington DC. This wonderful annual tradition created by the renowned a cappella men’s group The Augmented 8 (Winners of the Benjamin E. Cooper Award for Contributions to Ending Homelessness), has brought in thousands of dollars to end homelessness in our region. Join Venus d Minor and our aca-colleagues The Augmented 8, Word of Mouth, TBD and Pitch Please for a fun evening of entertainment that will make a difference in your community. Venus is looking forward to a year filled with new possibilities and performances. This winter we’ve been busy adding new repertoire–the “Cups” song, “Mexico,” “For Good” and “Will the Circle Be U nbroken” among others. We’re also polishing up our awesome arrangement of The Star Spangled Banner for baseball season! And we also held auditions and welcomed a new Venusian into our orbit–more on our new mezzo soprano in another blog post. Give us a shout if you want to book us for the spring — email amy@amydelouise.com. 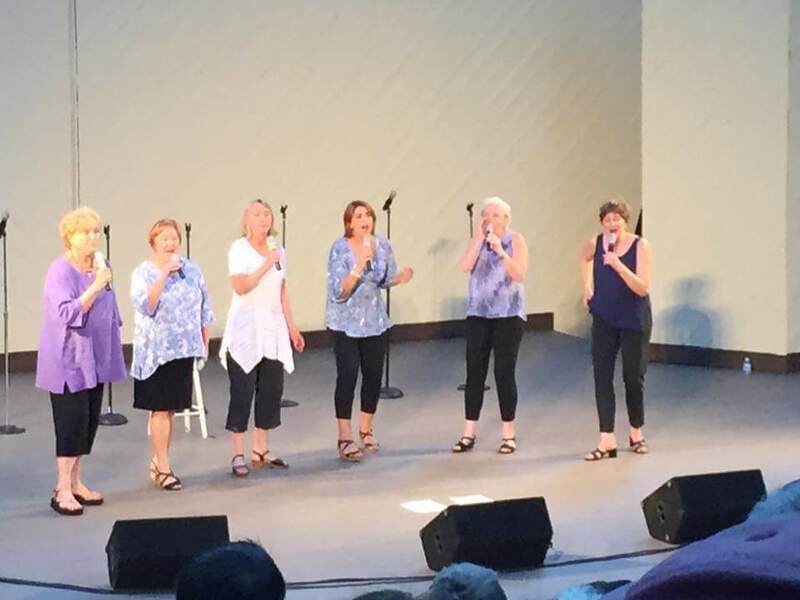 Well we sure had fun singing to a packed crowd at our favorite outdoor ampitheater in Virginia. We appreciate the invite from our friends The Tone Rangers. Next up, Venus sings the Star Spangled Banner on Monday, July 20th to open a college league Big Train baseball game at Cabin John Park in North Bethesda. Join us for another fun evening under the stars!